When a particle of dust is raised, it comprises the great earth. When a flower blooms, the world springs forth. But when dust is not yet raised, and a flower has not yet bloomed, how can it be seen? Therefore, I say, it is like cutting a skein of thread: with one cut, it is all cut; or like dyeing a skein of thread: with one dyeing, all is dyed. Now, if you cut off all complications, and bring forth your family treasure, then you comply everywhere with high and low, and there is no difference between front and back; each one will be fully manifest. If you are not yet so, look at the lines below. Compare: William Blake's verse: "To see a world in a grain of sand, /And a heaven in a wild flower; /Hold infinity in the palm of your hand, /And eternity in an hour." One hearing, a thousand realizations; one understanding, a thousand follow suit. The people with the middle and lower spirits hear much, but do not believe much. I will try to bring up the clear and the simple matter, look! Jinhua, whenever he was asked a question, only raised a finger. What news is there? Dull-witted teacher! This old fellow too would cut off the tongues of everyone on earth. When it's warm, all heaven and earth are warm; when it's cold, all heaven and earth are cold. He snatches away the tongues of everyone on earth. Why expend so much energy? Well now! I like Jinhua's way of answering. Who could compare with him throughout the whole universe? Since the universe has been emptied, who else is there? Making the blind turtle sink and swim and cling to it. In the night waves together we take in blind turtles. Thirty years he used it without wearing it out. but common people can't see it in front of them. Ultimately there are no mundane things before his eyes to see. yet expedients become endless in number. The device the more broad. Thousands of lands and seas swallowed up by a hair-tip. An ocean of billions of worlds is drunk in the tip of a hair. Boundless dragons falling into whose hands? Fish and dragons, limitless -- into whose hands do they fall? Ninko's holding the fishing pole is appreciated. Take care, Mr Ren, holding the fishing pole. I too raise one finger and say, "See?" Hongzhi then also raised a finger and said, "Look!" If you understand at the finger, then you turn your back on Jinhua; if you don't go to the finger to understand, then it's like case iron. Whether you understand or not, Jinhua still goes on this way; whether you're high or low, he still goes on this way; whether you're right or wrong, he still goes on this way. If you understand it as a finger, you definitely won't see the Ancient's meaning. This kind of Chan is easy to approach but hard to understand. People these days who just hold up a finger or a fist as soon as they're questioned are just indulging their spirits. It is still necessary to pierce the bone, penetrate to the marrow, and see all the way through in order to get it. Mountains, rivers, and earth, extending upward to the solitary heights; myriad forms in profuse array penetrate down through dangerous precipices. Where will you find one finger zen? Master Jinhua was from Jinhua in Wuzhou (in modern Zhejiang Province, south of the city of Hangzhou). 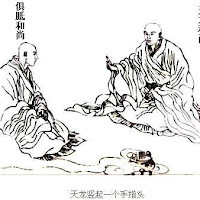 During the time he first dwelt in a hermitage, there was a nun named Shiji ('Reality') who came to his hut. When she got there she went straight in. Without taking off her rain hat she walked around his meditation seat three times holding her staff. "If you can speak," she said, "I'll take off my rain hat." She questioned him like this three times. Jinhua had no reply. Then as she was leaving Jinhua said, "The hour is rather late: would you stay the night?" The nun said, "If you can speak, I'll stay over." Again Jinhua had no reply. The nun then walked out. Jinhua sighed sorrowfully and said, "Although I inhabit the body of a man, still a lack a man's spirit." After this he aroused his zeal to clarify this matter. He meant to abandon his hermitage and travel to various places to call on teachers to ask for instruction, and had wrapped up his things for foot-travelling. But that night the spirit of the mountain tole him, "You don't have to leave this place. Tomorrow a flesh and blood bodhisattva will come and expound the truth for you, Master. You don't have to go." As it turned out, the following day Master Hangzhou actually came to the hermitage. Jinhua welcomed him ceremoniously and gave a full account of the previous events. Hangzhou just lifted up one finger to show him. Suddenly Jinhua was greatly enlightened. At the time Jinhua was most earnest and single minded, so that bottom of his bucket fell out easily. Later, whenever anything was asked, Jinhua just raised one finger. 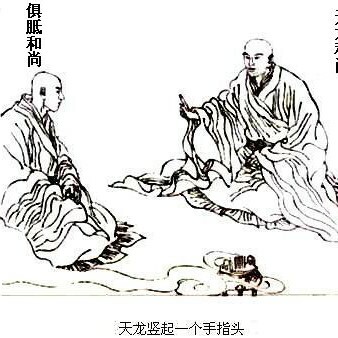 When he was nearing death, Jinhua said to his assembly, "I attained Hangzhou's one-finger Chan and have used it all my life without exhausting it. Do you want to understand?" He raised his finger, then died. Changquing (854-932): Delicious food is not for a satisfied man to eat. Xuansha (835-908): If I had seen him then, I would have broken the finger off. Xuanjiao: When Xuansha spoke this way, what was is meaning? Yunju Yi: When Xuansha spoke this way, was he agreeing with Jinhua or not? If he agreed with him, why did he speak of breaking off the finger? If he didn't agree with him, where was Jinhua's mistake? Caoshan: Jinhua's realization was crude: he only recognized one device, one perspective. Like everyone else, he claps his hands and slaps his palms, but I look upon Nanyuan as exceptional. Xuanjiao: But say, was Jinhua enlightened or not? Why was Jinhua's realization crude? How could the operative circumstances of question and answer be easy to reply to? Without money it's hard to be really stylish. He just holds up his finer in the midst of hurry. Who would ever visit him, anyhow? His tactic is bold, trying to silence everyone in the world with one finger. There shouldn't even be time to lift a finger; whatever meets the eyes is already complete. Jinhua's finger was that floating board with one hole in it. And many 'blind tortoises' followed one another to Jinhua's teaching, in their attempts to see the vision. But it was difficult for them to understand what the old Patriarch meant by the lifting up of one finger. It was, indeed, as difficult as it was for that blind tortoise to put his eye exactly below the hole in the floating board. What's the essential truth of Zen? He just raised one finger. Why did Bodhidharma come from the west? Raised one finger. Does a dog have Buddha nature? Raised one finger. What is your original face? Raised one finger. What is that one finger? It's not the finger pointing at the moon; it's the moon itself. The morning star that brought Buddha to enlightenment, the sun, the great earth, and all beings everywhere. It's enlightenment. It's delusion. It's effort. It's sloth. It's humility. It's pride. It's compassion and greed. Whatever you say it is, it's not that. Don't think that that finger represents something. That finger penetrates the depths of the ocean, and beyond the Milky Way. It penetrates to your best-kept secrets, and yet it hides nothing. It reveals Hangzhou's guts, and Jinhua's guts, and the boy-attendant's guts, and your guts! So tell me: How do you present that one finger? Jinhua's one finger was never exhausted, never boring, always there, always available. That one finger appears on countless hands. Jinhua some time in the 9th-century. Where is Jinhua's finger now? As we know from science, crystals are formed by first dissolving sufficient material into a liquid to form a supersaturated solution. If left in that state, nothing happens. To have crystals form, the beaker with the solution in it must be tapped lightly, to jar the solution. Jinhua's case was similar to this. Interiorly he was supersaturated and needed only to be jarred by the raising of a finger in order to come to realization. "How happy he must have been!" commented Nakagawa Sôen Roshi once, "It's vastly different from the enlightenment cases which occur today with the koans 'Mu' or 'The Sound of One Hand.'" At any rate, he broke open to clarity with scarcely a trace of delusion remaining. What did he see? The world where there is not one thing. He clearly understood that the single raised finger exhausted the entire universe, that by it the universe was annihilated. That was Gutei's providential karma. The raising of the one finger manifests the entire universe. 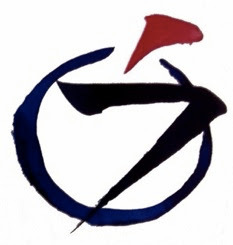 That is, Zen enlightenment is to see clearly the world of empty-oneness. This koan is a very good example of that. When the world of empty-oneness is clearly grasped in the raising of a finger, all delusions are cut off. "With one hack, it is all cut; with one dyeing, all is dyed." Only a person who has clearly realized his true self can really appreciate this story. before it appears, how can you see it? Empty it all, empty inside and out. Foghorn through fog and arugula. Next. Bow and I go in. but fails where it means. it travels to the moon. to see old Jinhua, get his answer. I arrive in the morning. A monk meets me at the gate. I sit down on a stone. The sun passes its zenith. Just one finger, for all my troubles? One finger for my life to make sense? Up? Down? Out like a hitchhiker? Could old Jinhua want a ride? What if he raises his pinky? three phalanges rattling in his cupped hand? Walk back down the mountain. Perhaps I'll make better time on the way home.